From supercars to citycars, significant presence of Magneti Marelli technologies on the important international previews on display until 15th March at the Geneva Motor Show and on the winner of the “Car of the Year” award, the Volkswagen Passat that adopts LED rearlamps made by Magneti Marelli Automotive Lighting. Within the lighting area, the technologies of Magneti Marelli Automotive Lighting are adopted by numerous carmakers. 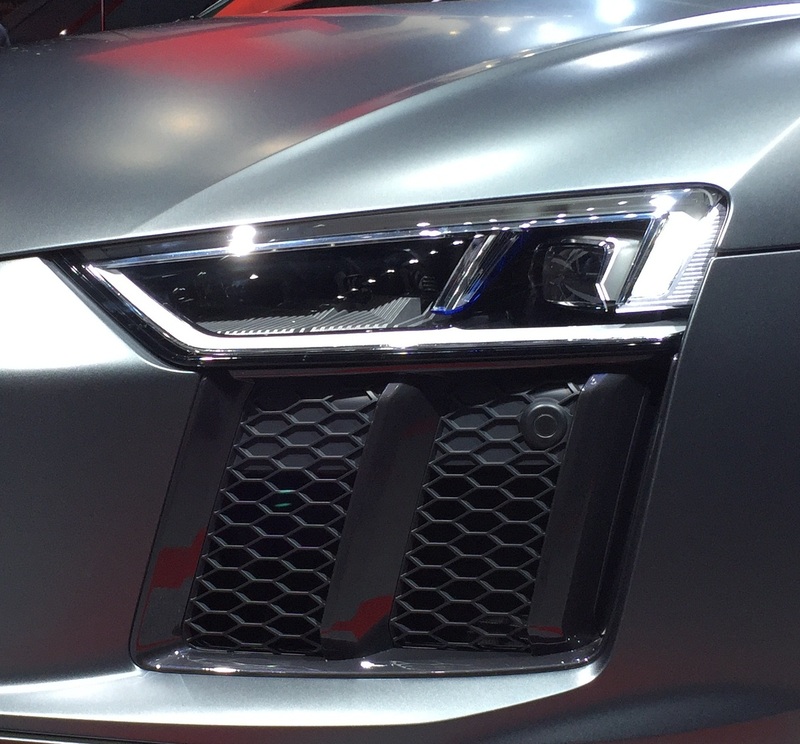 After the great interest shown in Paris in the Audi R8 LMX, the Audi R8, officially launched in Geneva, also has a front lighting system with additional main-beam laser module developed in collaboration with Magneti Marelli Automotive Lighting. In addition to adopting the full-LED technology for all the lighting functions, the headlamp of the R8 integrates an additional high-beam module with a 2 mm² laser light source which produces a high-intensity light beam thanks to very high-level precision optics. A phosphor converter transforms the beam into white light with a temperature of 5,500 degrees Kelvin - the ideal conditions for night vision. The full-LED headlights include High and Low Beam and Daytime Running Light (DRL). The Audi R8 also adopts Automotive Lighting LED rear lamps and so does the Audi Q7. Automotive Lighting enables a wide choice of lighting systems for the Mercedes-Benz CLA 45 AMG which can have halogen, bi-Xenon and bi-Xenon adaptive headlamps with AFS. Another relevant supply, the full-LED headlamps for the Mercedes Maybach. Magneti Marelli Automotive Lighting solutions can be found also on the Cadillac CTS-V (Xenon headlamps), the Honda Civic Type R (Halogen and LED headlamps and LED taillights), the Ford Mondeo and Ford S-Max (LED taillights), the Skoda Yeti (Halogen and Xenon headlamps) and the Volkswagen Passat All Track (LED taillights). In relation to high-performance cars, the Magneti Marelli presence is popular on all the most prestigious brands. On the new Ferrari 488 GTB Magneti Marelli is present with GDI pumps and Transmission Control Unit for the DCT dual-clutch gearbox, body computer and, in terms of suspension, a lifting system. For Porsche Magneti Marelli supplies its “tailor-made” instrument clusters. In particular the new Porsche 911 GT3 RS features the new instrument cluster with the traditional circular element design and reconfigurable 4.5-inch TFT display which gathers all the information useful for the driver; the TFT instrument cluster also for the other world debut, the Porsche Cayman GT4. Moreover, a relevant contribution by Magneti Marelli is the electronic control system and the hydraulic actuators for the AMT (Automatic Manual Transmission) system of the new Aston Martin Vantage GT3 and the lifting system (the lifting system raises the vehicle through a system of hydraulic drives and a pump operated by an electric motor and an electronic control unit) for the Lamborghini Aventador SV. With regard to the infotainment area, again present are the systems developed for the BMW Series 1 and Series 2 Grand Tourer (that also adopts the halogen and Xenon headlamps of Magneti Marelli Automotive Lighting). The infotainment system of the BMW is based on an “open source” technology concept and offers a sophisticated series of features, including navigation, brilliant graphics, Internet access and even wireless connectivity. In relation to Powertrain, instead, Magneti Marelli supplies for the Skoda the motorised throttle on the 1.4 GDI engine of the Skoda Superb (together with the GDI injectors), three MPI and TSI cylinders for the Skoda Fabia 1.0, four TSI cylinders for the 1.2 version and three TDI cylinders for the 1.4 version. Citroën presents the face lift of the C4 for which Magneti Marelli supplies headlamps with LED DRL and infotainment system, GDI pumps and motorised throttle for the 1.2 petrol version). Furthermore, Magneti Marelli supplies the new infotainment system “touch screen” for the Berlingo redesigned version. A face lift also for the Peugeot 208 that adopts the updated infotainment system with 7" high-resolution touch screen display (800x480 pixels). It is a modular device used to listen to music and view photos that allows, in its most advanced version, Internet connection via a USB stick. Through the new MirrorLink® function, the 7'' Pad Touch screen enables displaying of the Smartphone interface and taking advantage of a number of useful applications that are compatible with driving via the screen integrated within the dashboard and the use of voice commands. Connected to the CAN network of the car, it is also an HMI diagnostic interface with the ability to display information on the car and navigation, including on ZTL limited traffic areas. For FCA, the spotlight is still on the Alfa Romeo 4C Spider equipped with many Magneti Marelli technologies: Xenon headlamps and LED rear tail lights, shock absorbers and, in relation to Powertrain, ECU (Electronic Control Unit) and electro-hydraulic actuators of the dual-clutch gearbox. The Jeep Renegade adopts the new instrument panel developed by Magneti Marelli, which integrates several vehicle and infotainment functions in the display. Also provided by Magneti Marelli are the lighting systems, the Powertrain components, the electronic systems, the suspension systems, the shock absorbers, the plastic components and the exhaust systems. The Fiat 500X, with automatic dual-clutch transmission for which Magneti Marelli provides the Transmission Control Unit and the hydraulic actuators for the DCT system, was presented at the Geneva Motor Show. On board the crossover there are numerous Magneti Marelli technologies: the instrument panel, the front lighting with halogen headlamps and, optionally, with Xenon 25-watt headlamps. Again from Magneti Marelli come the electronic engine control unit, the motorised throttle, intake manifolds and PFI injectors for the 1.4 Multiair petrol engine, and motorised throttle with intake manifolds for the 2.4 petrol Tigershark plus shock absorbers, exhaust and suspension systems.